The Remington MB-200 Titanium Moustache and Beard Trimmer may look just like any other trimmer, but it has a lot of nifty features that makes trimming somewhat less of a hassle. With titanium coated blades and a sleek design, it can definitely deliver its intended use for a long time. The MB-200 has most, if not all of the features you would expect to find in a more expensive trimmer. It comes with a small price tag, but it is big on performance. Perfect for those people who want a neat and tidy beard or mustache, but need to function within a specified budget. The first thing you will probably notice about the Remington MB-200 Titanium mustache and beard trimmer is that its battery is not replaceable. Once it dies, the trimmer must be replaced. However, when you consider the price of this trimmer, replacing it when the battery wears out, should not be a problem even for those on a very strict budget. In our Battery, Power & Cord section, we will discuss some of the causes that can lead to battery damage and how to avoid it. Titanium coated blades that are self sharpening. Easy zoom wheel allows you to choose between 9 different length settings. Cuts clean with less pulling than many other brands. Rechargeable battery with LED indicator light. The length settings can be changed using the zoom wheel, making it very convenient to switch from one length setting to another. 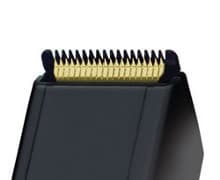 The unit only has one guide comb with 9 different length settings and because it’s adjustable, you don’t need to think about changing guide comb heads. It jumps by 1.5 mm steps between 2 and 6, which is quite adequate for precise trimming. Once you have fixed to one setting on the wheel, it gets well locked so even if you apply pressure during trimming, it won´t jump to lower setting. I was also very pleased to see that in case you do break one of the prongs of the comb, Remington is selling replacement combs at a very reasonable price. You will always enjoy a smooth trimming without any pulling of hair, which is a problem with some of the other trimmers, since the blades are coated with titanium. Its sharp and precision ground blades ensure that you cut hair cleanly without plucking hair. They are also self-sharpening, which makes MB200 free of any maintenance, and it will never have to be oiled. The trimmer´s head is washable which makes it easy to clean. After you finish, a simple rinse will remove all the loose hair. Battery and charging problems have been the biggest complaints of the users. Several people have reported that they were not happy with this issue. I went through hundreds of reviews to evaluate the gravity of the problem. Charging the battery too often- When you charge this battery before it is almost drained, you can shorten the battery life. Several users state they get 2 to 5 shaves or more off one charge. If some of the dissatisfied users are charging the battery after each use while there is still a good charge left, they may actually be shortening the life of the battery by overcharging it. Leaving the battery on charge too long- Some users don’t use this trimmer every day, but may be plugging it in to charge and leaving it plugged in until they next want to use it. Again this can cause the battery to become too overcharged and thus shorten the battery life considerably. While few negative reviews give enough information to know for sure if this trimmer’s batteries are being overcharged or drained before charging, it seems like this is the case with at least some of the instances since most of the positive reviewers had little problem with their battery. Do not charge after each use. Do not overcharge by leaving it on the charger all the time. The trimmer has NiCad ( Nickel-Cadmium ) batteries as opposed to NiMh batteries, which are considered to be more modern and durable. Something else I am also not impressed with is the fact that the trimmer cannot be used while it is plugged in. Many times we are in a hurry and if we find there is no charge, we just have to wait till it’s partially charged to be able to use it. The MB200 has a wide blade so it gets the job done faster. It also ensures that the edges and the lines are straight. Likewise, the non-slip handle makes it easy to use and to be gripped, so you don’t have to think about the unit slipping off from your hand. The motor is also quite strong, which is especially helpful for those with coarse or thick beards and moustaches. 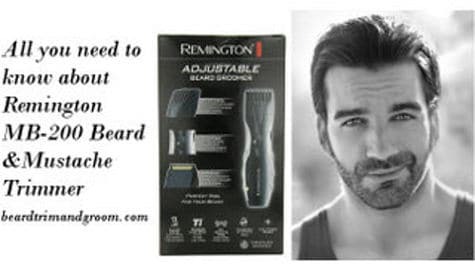 The ratings and reviews for the Remington MB200 Titanium Mustache and Beard Trimmer are better than average. Looking through the reviews it is clear to see that there is division between those people who really love this trimmer and think it is perfect for their needs and those who are disappointed over their trimmer having a short battery life. Here are some of the things that users have to say about the MB200. One thing that most users do agree on is that cutting quality of this trimmer is exceptional. The Titanium blades are sharp and give a close even trim. Best of all most users did not experience hair pulling which they have experienced with other trimmers they have tried. The MB200 comes equipped with a NiCad battery which is subject to battery effect and many users one complaint regarding this trimmer is the battery. They state that it takes a long time to charge and there is no charge indicator telling them when they should recharge the battery. While some people consider the price of the MB200 and feel that the short battery life is not a major issue because replacing this trimmer is not at all expensive, others are disappointed that it doesn’t last as long as they wanted or hoped. Most users do state that they would feel better about this trimmer if it ran with the cord attached. Users like the 9 height adjustments that are on this trimmer and they feel that the dial locks in the heights well. Users also feel that is easy to adjust the height just where you want it. Users feel that the MB200 is an overall durable trimmer with some users having owned this trimmer as long a 5 years. Users do like the fact that blades are easy to maintain and the head can be removed making for easier cleaning. They do state that they wish the trimmer came with a charging dock as you have to lay it flat on the counter when charging it. In addition, most users really like this price of this trimmer and it is one of the major reasons most users purchase the MB200 to begin with. The Remington MB200 weighs just around 1 pound and has a dimension of 3.5 x 5.8 x 10 inches. It is handy, yet sturdy at the same time. The blade is wide, measuring at around 3.5 inches. The MB-200 does not come with a travel case. It simply comes in a box with the charging cable. It’s not really much of a hassle since the Remington MB200 does not have any interchangeable guide combs or other accessories. The Remington MB200 Titanium Moustache and Beard Trimmer. The MB200 is actually one of the most reasonably-priced trimmers for the features that it offers. At a price of under $35, it functions way better than other even more expensive products. The unit is covered with a 2-year warranty. Apart from the niggling feeling I have about the battery charging issue, everything else appears to be very good. With the battery problem, if you follow the points given above regarding the charging procedure and the do´s and don´ts, it should last you for a long time. 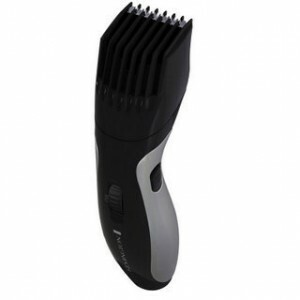 The functionality of this trimmer combined with the large range of height settings and the extremely low price make Remingtion MB200 mustache and beard trimmer worth considering for anyone on budget who wants to keep their beard and mustache well groomed.